I’ve been a Civ fan for awhile but ever since I bought Civ4 I have always wondered about something. Why didn’t they use the actual countries’ flags for the game? America is a blue banner with a white star???? What was that all about? There is, in fact, a very specific answer to that question. Can anyone guess why we didn’t use actual country flags in Civ4? To help narrow down the set of possibilities, I’ll add that the answer doesn’t have anything to do with political correctness or historical sensitivity. Here’s screenshot to demonstrate what Kevin is talking about. Was it to save on GUI space width-wise? An even simpler answer would be that the role of the flag is to associate a the unit with the civ through colour. So it would come down to an issue of contrast and identifiability – the British flag is red, white, and blue – as is the American Flag – they can’t both be blue civs so one would have to have a flag that doesn’t relate to the civ’s colour? Because all of the flags use only two colors. Because you discovered a secret algorithm that revealed every nation’s true nature in graphic form, which you decided better represented that nation than their actual flags, which had the fatal flaw of being created by humans. I’ve wondered that myself. EU and Victoria (Paradox) use fairly detailed flags in its interface that add nicely to flavor in the game. However, the time period and scope of those games are limited. Civ spans several millenia; perhaps you felt that using the same detailed flag at 4000BC and 2000AD didn’t make sense. i think some political correctness was considered. after all, french fans wouldn’t feel good playing as the white flag. seriously, though, i would say that zoomed out the nations’ flags are hard to distinguish from one another. so they stuck with single background color and simple symbol. I agree that it has to do with solid colours being easily distinguishable, and would add that giving America a solid blue also allows the player to correspond the faction with the blue blotch of territory on the minimap, the blue outline of the cities, and the blue line on the power graph. It’s an interface consideration through and through. Yep. it’s the color gig. It makes for continuity with the unit markings, the city markings, the influence map markings. Matching the predominant color on the banner to the civilization’s color makes sense. But another significant factor (I would think) is that flags often have a lot of detail (think of the 50 stars on the US flag) that don’t scale well to low resolutions. Actually aren’t the flags a single colour? Because if you set whiteFlag to 0 in Civ4CivilizationInfos.xml then the player colour shows through instead of white. My guess would be that flags of countries, since they’re all rectangular or squared, don’t look good in banner form. These comments are pretty hilarious. Surely you all realise that, over the course of 4000BC to 2000AD, most countries have had roughly 1000 different types of flag, heraldry or symbol to represent them? Infact, the concept of a nation is quite a modern one, and the “logo” would often change whenever the leader did. (So, yes, in a way, this does present some problems keeping the colours of the flag in association with the civ). What I think we should [i]all[/i] be asking ourselves (and Soren, natch) is the following question: Why on earth do the Civilization games always have the “Americans”* in it when they’re only 300odd years old themselves? *And don’t fob me off with the excuse that they represent the Nativa Americans… they usually have their own nations. Colour me stupid, but isn’t the using one star representing, basically, a totalitarian dictatorship ruling over a single state in the civ? (ie; all civ’s basically! 🙂 ). Funny stuff if I’m right 🙂 I had to check Wikipedia to be sure. It’s also nice and iconic, small enough to be an icon (rather then the huge red and white and blue affair – this is the case with other countries who use “simplified” ones too) and red and white is used for other countries (Britain and Japan mainly, with red being Japan’s main colour, white being Britain’s) so that’d get a bit confusing too as the others have said. I wonder if it has anything to do with the Liberian flag though ( http://en.wikipedia.org/wiki/Flag_of_Liberia ), I’ve no idea. Flag of every country was choosen depending from historical aspects. In civilisation you make your own history so it is doesn’t really matter what flag is. Also this flag looks more like Somalia. OK Soren, I just have to post this. Quite relevant! So, the essential reason that we did not use “real” flags is that the player colors on the flags are dynamic, not static. In other words, the flag colors are created on the fly based on the civ’s player color. 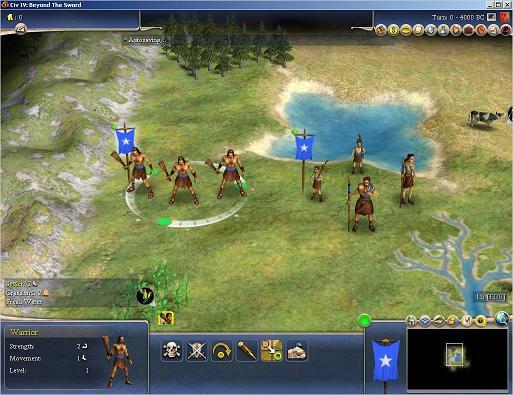 Thus, most of the time, American civs will be light blue not because that is the flag’s color but because the player with the American civ has a light blue player color. What’s the difference? Well, what if the game is multi-player with three American civs? They can’t all have a light blue background, or it would be impossible to tell them apart. Instead, the game will generate two “new” player color sets for the extra two American civs and give the familiar flag new color sets. We felt using real flags would make this process more problematic as many real flags have three (or more!) colors on them. Having said that, many of the reasons guessed above are all good reasons (a singular color; the vertical flag; the clear icons) for our choice, but the multiple-civs-of-one-type was the ultimate problem that caused us to choose this solution. It is possible, however, that we made the wrong choice as we made a fairly big decision based off of, essentially, an edge case. It’s certainly a point for debate. An extra note is that this consideration does not apply to scenarios because, of course, there can only be one American civ in the American Revolution scenario. Thus, we did use the real flag in that situation. Ahh, neato 🙂 I forgot entirely about the multiple-same-civs case, doh. What a simple answer! At least it’s easier for most of the other civs, which generally have two-colour flags or one icon on a single colour background. I think it was the right flag to choose, looks like some possible early American one, more so then red and white stripes (which are used in other countries flags more predominately). I mean, black lines on a purple background. Sigh. Yeah, the same-civ/multiple-leaders problem is an elegant answer, followed closely by the “which color goes with which civ” problem. As for those cheeky Americans and their historical infancy, I’m sure there’s a bit of developer perogative in there, not to discount the role of the U.S. in shaping modern civilization (and game sales) worldwide. Even with the real flags, you could swap the colors by having each player color actually be a set of colors. If everybody picked the US, for example, you could end up with the plain flag, one with blue/white stripes and a red square, a red/blue striped one with a white square, and when you run out of permutations of red, white and blue you’d end up with other common flag colors: permutations of red/yellow/green and red/white/black most likely. A more pressing problem with actual flags, I think, would be a matter of which one to use. Flags change over time, so a given nation may have many flags throughout time. Do you use the most recent? First? Longest-used? Change the flag throughout the game? If you do the last of these, you run into the problem that the sides in Civilization don’t always represent nations, and when they do the nation isn’t always present throughout history in the real world.